It all began on Hawaii Island. 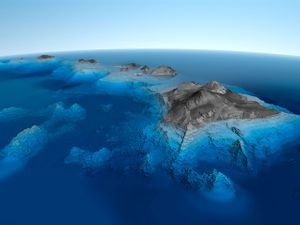 The youngest island in the archipelago, Hawaii Island was believed to be the first island Polynesian voyagers from the Marquesas Islands set foot on 1,500 years ago at Ka Lae (South Point). You can explore early Hawaiian culture today at Puuhonua o Honaunau National Historic Park. This last place of refuge for kapu (taboo) breakers on the Kona Coast, is a 180-acre, completely restored compound offering an authentic look at Native Hawaiian temple ruins, royal grounds, fish ponds, sacred burial spots and petroglyphs from before western contact. In 1778, Captain Cook arrived on Kauai, opening the door to an influx of westerners. Only a year later on Hawaii Island, warriors at Kealakekua Bay killed Cook after a contentious chain of events. Today, a monument stands in this marine life preserve in honor of Captain Cook. During this time of discovery, Hawaii Island was divided into separate chiefdoms and war between factions was common. In 1790-1791, Kamehameha built the Puukohola Heiau National Historic Site in North Kohala as a tribute to the war god Kukailimoku to help in his efforts to unite the Hawaiian Islands. This was the last major religious heiau (religious temple) built by early Hawaiians and the largest restored heiau in Hawaii. Soon after completion, the Kohala-born Kamehameha conquered Hawaii Island and went on to unify the Hawaiian Kingdom. Hawaii Island was also the home to King Kamehameha’s court until it moved to Oahu in 1804. In 1812, Kamehameha the Great returned to his beloved Hawaii Island where he died in 1819. You can see the original King Kamehameha I statue in Kapaau, not far from where Hawaii’s greatest king was born.